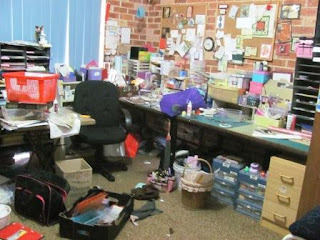 It is unbelievable how much stuff one accumulates crafting even more so when one used to teach it and sell some of the products as well, though it was never really a shop or business but rather a service that I offered when the local Spotlight store didn''t stock much papercraft esp in the early days of the craft. I need to clear my craft room and convert it back into a bedroom in preparation for visitors esp my eldest son & his family, who will be moving to Sydney eventually but needs to have a few months 'breathing' space whilst they have time to look for the best accommodation rather than take the first one available. So I had to start the mammoth job of tackling the room. It was a large bedroom with a built in double wardrobe that was chokka black full plus 2 desks, 2 high bookcases, 4 smaller bookcases. Pegboards and cork boards lined the walls and were full. My son who finally moved the last desk and filing cabinet yesterday commented that he had no idea that there was so much stuff until he goes upstairs, which is where I am relocating to, and he sees all the boxes of stuff on the floor. I have not started to organize the stuff upstairs yet as with only 1 month notice that my son was moving in, my first priority was to get the bedroom back into shape. Hence the stuff upstairs is spread out everywhere mostly horizontal until I can get it into the cupboards etc. Not sure what I am going to do yet as I don't have a built in wardrobe up there. The 'old games' room up there is twice the size of the large bedroom downstairs. 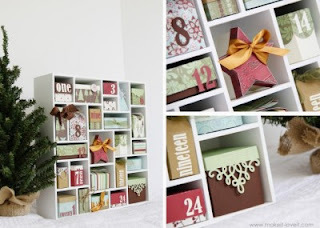 We are not going to spend a lot of money to make it all pretty and co-ordinated. It will be odds and ends and whatever wardrobes I can scrounge up from recycle centres and op-shops. I am not even going to spend the time and money painting it either. Sure it would be nice to have it all pretty, painted or newly co-ordinated but my priority is practicality and to be honest I have far too much stuff to pack away prettily! Is your craft area a pretty place or like a bomb hit it?